The beewolf larva hibernates for several months in its cocoon before the adult insect hatches. Antibiotics on the surface of the cocoon, produced by symbionts, guarantee protection against microbial pests during such long developmental stage. The amount of antibiotics was visualized by means of imaging techniques based on mass spectrometry (LDI imaging) and merged as pseudocolors onto the cocoon. Digger wasps of the genus Philanthus, so-called beewolves, house beneficial bacteria on their cocoons that guarantee protection against harmful microorganisms. Scientists of the Max Planck Institute for Chemical Ecology in Jena teamed up with researchers at the University of Regensburg and the Jena Leibniz Institute for Natural Product Research – Hans-Knoell-Institute - and discovered that bacteria of the genus Streptomyces produce a cocktail of nine different antibiotics and thereby fend off invading pathogens. Many insects spend a part of their life underground and are exposed to the risk of fungal or bacterial infections. This is also the case for many digger wasp species that construct underground nests. Unlike bees that use pollen and nectar as food to nurture their larvae, digger wasps hunt insects to feed their offspring. Because of the warm and humid conditions as well as the large amounts of organic material in their subterranean nest, both their food supply and their larvae are endangered by pathogens - mold and bacterial infection are a major threat and can cause larval death in many cases. Beewolves, i.e. digger wasps that hunt for bees to feed their larvae, have evolved an elegant solution to the problem of fungal and bacterial infection. Martin Kaltenpoth and colleagues from the University of Wurzburg had already shown several years ago that beewolves form a symbiotic relationship with bacteria of the genus Streptomyces. Female beewolves cultivate these bacteria in specialized antennal gland reservoirs and apply them to the ceiling of the brood cells. 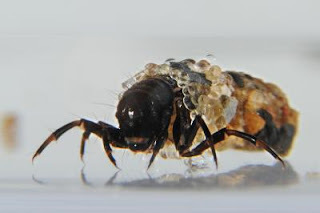 Beewolf larvae later take up the bacteria and transfer the symbionts actively to their cocoons, thereby increasing their survival probability. However, it has been unclear so far how the protection is achieved. Scientists of the groups of Aleš Svatoš and Martin Kaltenpoth at the Max Planck Institute in cooperation with their colleagues at the University of Regensburg and the Hans-Knoell-Institute in Jena now discovered that the symbionts produce nine different antibiotic substances. For the first time the biologists were able to identify these substances directly in the natural environment, i.e. on the beewolf cocoon (see figure). Other studies on protective symbioses could detect antibiotic substances only after isolation and cultivation of the symbionts in artificial culture media. By means of a novel technique of imaging mass spectrometry (LDI imaging), the Jena scientists could demonstrate that the antibiotics are primarily present on the exterior of the cocoon, reducing the risk of potentially harmful side-effects on the larvae. In biotests with different pathogenic fungi and bacteria the scientists observed that beewolves utilize the principle of combination medication: "A combined treatment with streptochlorin and eight different piericidines we were able to isolate from the cocoon helps to fend off a very broad spectrum of microorganisms; this cannot be achieved with a single substance. This means that millions of years ago, beewolves and their symbionts have already evolved a strategy that is known from human medicine as combination prophylaxis" explains Johannes Kroiss, first author of the study. With their work the researchers break new ground: "Astonishingly, little is known about the ecological importance of antibiotics in their natural environment. Supported by mass spectrometric imaging we are now able to better understand the natural role of antibiotic substances in the environment," says Aleš Svatoš, leader of the mass spectrometry research group. The imaging techniques can help to provide important insights, especially into the exploration of symbiotic interactions. Despite its resemblance to Hollywood's fictional "Alien," the critter shown here is a caddisfly larva known to western US fly fishermen as a "rock roller." The larva builds and carries its own underwater shelter case, using ribbons of natural sticky silk to stitch together grains of sand and rock (right rear of this photo.) But when placed in a lab aquarium with glass beads instead of sand grains, the larva uses its wet silk to add beads to its shelter case (center). Russell Stewart, a University of Utah bioengineer, hopes to make a synthetic version of the caddisfly silk for use as a surgical adhesive. Like silkworm moths, butterflies and spiders, caddisfly larvae spin silk, but they do so underwater instead on dry land. Now, University of Utah researchers have discovered why the fly's silk is sticky when wet and how that may make it valuable as an adhesive tape during surgery. "Silk from caddisfly larvae – known to western fly fishermen as 'rock rollers' – may be useful some day as a medical bioadhesive for sticking to wet tissues," says Russell Stewart, an associate professor of bioengineering and principal author of a new study of the fly silk's chemical and structural properties. "I picture it as sort of a wet Band-Aid, maybe used internally in surgery – like using a piece of tape to close an incision as opposed to sutures," he adds. "Gluing things together underwater is not easy. Have you ever tried to put a Band-Aid on in the shower? 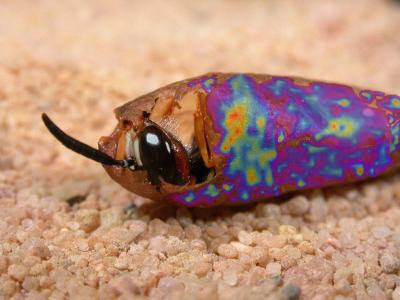 This insect has been doing this for 150 million to 200 million years." The new study, funded by the National Science Foundation, is set for publication this week in Biomacromolecules, a journal of the American Chemical Society. There are thousands of caddisfly species worldwide in an order of insects named Trichoptera that are related to Lepidoptera, the order that includes moths and butterflies that spin dry silk. Because caddisflies are eaten by trout, fly fishermen use caddisfly lures. Some species spend their larval stages developing underwater, and build an inch-long, tube-shaped case or shelter around themselves using sticky silk and grains of rock or sand. Other species use silk, small sticks and pieces of leaves. Each larva has a head and four legs that stick out from the tube. The larval case often is conical because it gets wider as the larva grows. A caddisfly larva eventually pupates, sealing off the tube as it develops into an adult fly and then hatches. Aquatic caddisflies and terrestrial butterflies and moths diverged from a common silk-spinning ancestor some 150 million to 200 million years ago. Caddisflies now live around the world in waters ranging from fast streams to quiet marshes. 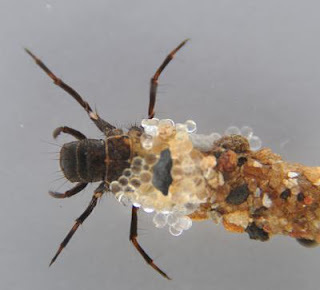 "The caddisflies' successful penetration into diverse aquatic habitats is largely due to the inventive use by their larva of underwater silk to build elaborate structures for protection and food gathering," the new study says. Caddisflies fall into subgroups. Brachycentrus echo, the species Stewart studied, is one of the casemakers, which build their case and then drag it along with them underwater as they forage for food. Some caddisfly larva are retreatmakers, which build a stationary dome-shaped shelter glued to a rock, with a silk net to catch passing food. This picture from a scanning electron microscope, magnified 100 times, shows a mesh of wet adhesive silk ribbon produced by a caddisfly larva to stitch together the inside of its shelter case, made with glass beads it was given in a laboratory aquarium. University of Utah bioengineer Russell Stewart hopes this natural adhesive can be developed into a sticky tape for surgical uses. Stewart studies natural adhesives, including glue produced in intertidal ocean waters by the sandcastle worm. It has potential as glue for repairing small broken bones. He got interested in caddisfly larva adhesive silk tape after he was contacted by a Smithsonian Institution scientist who showed him several of the tube-shaped larval cases. "We looked inside a case through a microscope and saw these silk struts between the rocks and realized this is really interesting," he says. "So I came home and put on my fly fishing boots and started wandering mountain streams looking for caddisfly larvae." Stewart and study co-author Ching Shuen Wang – who works in Stewart's lab – studied the caddisfly species B. echo from the lower Provo River about an hour south of Salt Lake City. Bioengineering undergraduate student Nick Ashton gathered the fly larvae and figured out how to keep them alive in the lab. "There's just a fascinating diversity of these insects. Their adhesive is able to bond to a wide range of surfaces underwater: soft and hard, organic and inorganic. If we could copy this adhesive it would be useful on a wide range of tissue types." Caddisfly larvae extrude adhesive silk ribbon out of an organ known as the spinneret. The products of two silk glands converge there, so the extruded adhesive looks like a double ribbon with a seam the long way. The larvae weave this sticky mesh back and forth around sand grains, sticks or leaf pieces to create the tubes they occupy. Stewart and colleagues grew caddisfly larvae in aquariums, but with glass beads instead of the sand and rock grains found in streams. The larvae expanded their rock cases using the beads, which were glued together from the inside by wet silk ribbons. The researchers broke off some beads to obtain clean samples of silk. 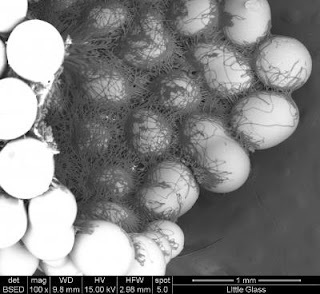 They analyzed the silk using several methods, including scanning electron microscopy, which showed how silk fibers stitched together the glass beads from inside of the shelter case. "It's like using Scotch tape on the inside of a box to hold it together," Stewart says. "It's really like a tape more than anything else – a tape that works underwater." Stewart hasn't studied the strength of the caddisfly silk, but plans to do so. "Individual threads aren't very strong, but it lays down dozens of them. If we can copy this material and make tape out of it, the bond strength would go up dramatically." Stewart's study included detailed analysis of the chemistry and structure of the caddisfly silk, showing how it is similar to what silkworm moths produce for use in textiles and even to spider web silk, but with adaptations that make it work underwater. Stewart says his goal was to characterize the adhesive silk fiber "for the purpose of trying to copy it" so a synthetic version can be used as a surgical adhesive. he found the caddisfly silk is a fiber made of large proteins named fibroin (fye-bro-in) with an amino acid named serine making up a fifth of the amino acids in fibroin. The key difference between dry silks from moths and butterflies and wet silks from caddisflies is that the serines in the silk from caddisflies are "phosphorylated," meaning phosphates are added to the serines as the fibroin silk protein is synthesized. "Phosphates are well-known adhesion promoters used in dental fixtures such as crowns or fillings," says Stewart. "They are also in latex paints that are water-based, and the phosphates increase the adhesion of those paints. The paint industry discovered this fairly recently. Caddisflies have been doing this for at least 150 million years." The phosphates attached to the serines are negatively charged. Other amino acids in the protein are positively charged. Stewart found that is a key factor in making silk underwater. Chains of proteins – each with alternating regions of positive and negative charges – line up in parallel with positive and negative charges attracting each other. "Imagine those chains aligned side-by-side, but staggered so the pluses and minuses are lined up, which then forms silk fibers with lots and lots of these protein chains in one fiber," Stewart says. "You wouldn't be able to make shirts out of it, but you might be able to make wet Band-Aids." Stewart made a counterintuitive finding about how wet silks are made. "These fibroin proteins that make up the silks are water-soluble because of the electrical charges. Ironically – and this is our hypothesis for now – the association of those plus or minus charges makes them water-insoluble. This is how you make a silk fiber under water." Comparison with amino acids from three other caddisfly species found great similarities, suggesting other caddisflies also use phosphorylation to spin silk underwater. Stewart says caddisfly silk and sandcastle worm glue are similar: their proteins are heavily phosphorylated and have a large number of positively charged amino acids. He says the ability to make adhesives underwater now has been identified in four phyla – major categories of living organisms – that include caddisflies, sandcastle worms, mussels and sea cucumbers. "They came to this underwater adhesion solution completely independently," showing that it repeatedly evolved because of its value in helping the creatures live and thrive, Stewart says. This caddisfly larva -- known as a "rock roller" to Utah and Wyoming fly fishermen -- lives underwater and spins natural sticky silk to build an underwater mobile home or case made of sand and rock grains (right half of image). But when placed in a laboratory aquarium with glass beads, the larva uses those beads to continue building its case (center). University of Utah bioengineer Russell Stewart has characterized the caddisfly's wet adhesive silk and hopes to synthesize a version for use as an adhesive tape during surgery. Long-wavelength VCSELs (Vertical-Cavity Surface-Emitting Lasers) for the next generation of high-speed communication systems have been developed in the European project MOSEL, a three-year joint research program lead by CEA-Leti (Grenoble, FR). The research on long-wavelength VCSELs is aimed at finding an efficient and reliable technological answer to the ever-growing demands for bandwidth in telecommunication networks. Moreover, VCSEL technology offers low power consumption (from five to 10 times less than the conventional edge-emitting lasers) and can be manufactured in volume at low cost. During the three years of the project, the six partners have worked together to push long-wavelength VCSEL technology from lab to industry. The MOSEL project was lead by CEA-Leti (France) and included three academic partners: DTU Fotonik (Denmark), EPFL (Switzerland), and KTH (Sweden), and two industrial partners: Alight Technologies (Denmark) and BeamExpress (Switzerland). The project demonstrated error-free 10GBASE-LR operation up to 100 °C, concurrently with record performance: single-mode (>30dB SMSR) power of >1mW up to 100°C (>2mW at room temperature) and 10Gbps modulation and transmission over 10-km single mode fiber with BER <10–11 up to 100°C with <1-dB power penalty. These performances allow industrial partners to address different previously established standards and pursue commercialization of the results. At the same time, the academic partners have demonstrated different proofs of innovative concepts, preparing the basis for the next device generation. The ever-growing demands for bandwidth in telecommunication networks, mainly caused by the unprecedented growth in data traffic in local and access networks, necessitate the development of new, low-cost, high-speed optical links in the 1–100 Gbps range. In contrast to the earlier evolution of optical fiber networks, the needs for high-bandwidth transmission have shifted from the high-capacity links (such as intercontinental and intercity) towards the network environment of the end users. This development puts the emphasis on low-cost, intelligent and scalable networks that can be deployed throughout the entire network hierarchy, ranging from metropolitan and local area networks (LANs) to access networks such as fiber-to-the-home (FTTH) and passive optical networks (PONs). Due to their intrinsic performances (power consumption, beam quality) and low cost potential (mass production already proven in the case of optical mice), long- wavelength VCSELs provide a technological solution to an economical problem. Indeed, employing novel concepts for mode control and current injection has enabled the consortium to demonstrate device performances similar to or, in some cases, surpassing those of conventional edge-emitting lasers. Researchers of Isfahan University, Iran, managed to synthesize a kind of cost-effective magnetic nanoparticles. Magnetic nanoparticles are applied in the production of ferrofluids which are used in targeted drug delivery and diagnostic imaging. "We conducted a research with the aim of synthesizing cobalt-zinc ferrite nanopowders by co-precipitation chemical method and detecting their physical properties," Mortaza Mozaffari said to the news service of INIC. "Most of nanoparticles synthesis methods are not economically appropriate for production at large scale because they are expensive and include toxic agents, complicated production steps, high reaction temperatures, and long reaction times," he added. Noting that co-precipitation method has a relatively better size control and distribution compared to other methods, Mozaffari reiterated that it is also a reliable method for producing nanoparticles from the environmental consequences and laboratory safety points of view. "In this study, first sodium hydroxide solution of definite pH was stirred at constant rate at room temperature. Meanwhile, definite amounts of cobalt chloride, zinc chloride, and ferrous chloride solutions were mixed together and their temperature amounted to ST. This mixture then was added to preheated sodium hydroxide solution abruptly and stirring this precipitate at constant pH, stirring rate, and temperature, kept on for one hour to ensure the formation of complete homogenous cobalt-zinc ferrite phase," he said. Mozaffari continued saying that the precipitate resulting from reaction was refined and rinsed several times with water and the produced powder was dried at room temperature. The synthesis of cobalt-zinc ferrite nanocrystals of crystal sizes less than 10 nm and homogenous size distribution in a way that it would be able to completely form the desired ferrite phase made up for the need to baking for phase formation consequently followed by production costs reduction. The details of this research can be found at the Journal of Magnetism and Magnetic Materials, volume 322, pages 383 to 388, 2009. The Fraunhofer Research Institution for Electronic Nano Systems (ENAS) introduced the first scientific results of a German-Japanese research cooperation together with the Japanese research group of Prof. Dr. Thomas Gessner in the World Premier International Research Center - Advanced Institute for Material Research (short: WPI-AIMR) at the nano tech 2010 in Tokyo/Japan. Prof. Gessner, director of Fraunhofer ENAS and president of Center for Microtechnologies at the Chemnitz University of Technology, is one of the Principal Investigators within the framework of WPI-AIMR at the Tohoku University. His researcher group in the thrust Device/System is leaded by Prof. Dr. Yu-Ching Lin. Four researchers and one exchange student from Germany work in this group together. They focus their investigations on bonding by using nano structures and metallic glass as well as MEMS (micro-electro-mechanical systems) with innovative functional materials. The researchers analyze applications of metallic glass in micro systems. Therefore metallic glass combines desirable attributes like high strength, good wear-resistance and electrical conductivity. The German-Japanese cooperation showed the first qualified samples of the novel material for application in micro systems at the nano tech 2010 in Tokyo in February. Additionally the Fraunhofer scientists demonstrated possible applications for the printed battery, a common development of the Institute for Print and Media Technology at the Chemnitz University of Technology and the Menippos GmbH. These small, extremely flat and environmental friendly batteries can be used as power source for small displays. The New York Times Magazine chose the printed battery to one of the five best ideas of the year 2009 in the category technology. World Premier International Research Center: The Tohoku University in Sendai belongs to the five selected World Premier International Research Centers (short: WPI) in Japan. The WPI is a project of the Japanese ministry for education, culture, sports, sciences and technology. The WPI-AIMR started in Sendai in October 2007 and is specialized in the multidisciplinary development of novel materials and functional principles. Energy-efficient systems and wireless sensor technologies will be highlighted at the IVAM Product Pavilion at MicroNanoTec/ HANNOVER MESSE trade show to be held April 19-23, 2010. Current trends for different industrial applications in the field of microsystems technology will be the focus this spring at the IVAM Product Market exhibit entitled “Micro, Nano & Materials.” Ivam again presents the highlight exhibits of leading companies in micro and nano industries. The joint pavilion is organized by the IVAM Microtechnology Network and features the innovative products below. At MicroNanoTec 2010 Polytec GmbH presents its latest solutions for high-sensitivity measurements and intuitive visualization of ultra-high-frequent motions of micro- and nanostructures. The award winning optical measurement technology of the company allows acquiring smallest amplitudes in the sub-pm-range with GHz frequencies. This makes it an indispensable tool for the development of state-of-the-art products with micro- and nanomechanical functions. These are, for instance, MEMS, MOEMS and RF-MEMS components, or ultra-sonic transducers, as used in today’s high-tech professional and consumer products. Besides the out-of-plane and in-plane motion data, the Polytec Micro System Analyzer also measures the 3-D topography of the tested device. This year, NanoFocus AG again presents innovative 3D measurement methods for surface inspection in the quality assurance process. In particular, the confocal 3D measurement, for example with the microscope μsurf explorer, is adapted optimally for measuring topography and roughness in laboratories and the production process. With the μsurf explorer, the enterprise offers a complete package including the software μsoft analysis for the first time. NanoFocus systems are already used for the monitoring of surfaces in the automotive, steel and printing industries. InfiniteFocus is a high-resolution optical 3D measurement device to measure form and roughness in one system, presented by the Austrian exhibitor Alicona. Amongst others, the system is used in the tool and dental industry. In the field of precision manufacturing the optical microCMM (coordinate measurement machine) is successfully used to measure e.g. extremely small radii. FRT, Fries Research & Technology GmbH presents a new 3D microscope with confocal and interferometric technology in Hanover. Dual Technology, shortly DT, completes the name of the new MicroSpy Topo from FRT. This surface metrology tool combines spinning-disc confocal microscopy with whitelight interferometry. This allows non-contact and fast measurements of both slightly and strongly structured surfaces. The new product is especially attractive for users in micro- and nanotechnology due to its versatility and its high resolution. The tool is used in R&D and production control and measures roughness, contour, 3D topography and more. IMT Masken und Teilungen AG from Switzerland, a leading supplier of custom-made microstructures, exhibits in Hanover for the first time this year. In the recent years, the company has continually expanded its services. The result is an advanced know-how in manufacturing sub-μm gratings and optical wave guides, in applying and microstructuring optical and metallic coatings, and in manufacturing micro channels and electrodes. This versatility in combination with its capabilities for large-scale production makes IMT a valuable partner and supplier of microstructures for companies active in bio-photonics, life sciences, microfluidics, optics, measurement technology and sensor fabrication. The Dutch precision supplier Etchform BV presents customized solutions for metal precision parts at HANNOVER MESSE. The production of thin metal precision parts by means of precision etching and electroforming is as much part of the product portfolio as are standard copper and stainless steel alloys. Etchform also develops specialties such as beryllium copper, Elgiloy/Phynox, gold, Invar/Kovar, molybdenum, silver and titanium. One-off and mass production are just as possible as additional surface and heat treatments and precision mechanical, assembly and logistic services. The exhibitor presents micro and nano metal and precision parts and tools, such as molding tools, stamps, shims, micro stencils, filter sieves, vaporizer nozzles, ink-jet nozzles, apertures, probes and gears. The new L³ LIMO Line Lasers technology from LIMO Lissotschenko Mikrooptik GmbH enables the development of customized production processes. The line lasers are based on process-optimized beam shapes and allow the selection of the optimum process window for scaling the system to the industrial production level with most efficient operation and shortest return on investment time. Due to a variety of processing heads the devices can be used for any types of materials. In addition to process development, these laser sources are also designed for improvement of new thin films (e.g. solar cells, semiconductor devices) and other applications with strongest demand for high energy efficiency. The line lasers are optimized for annealing, crystallization and tempering of thin films with high-speed linear scanning processes. Furthermore, the lasers can also be used for rapid thermal inspection and quality assurance. development. At HANNOVER MESSE, IMS will present its latest development N-GAP, the Next Generation Assembly Platform. This platform is realized within a short lead time and manufactures very complex, small products at high speed. N-GAP is co-financed by the European Fund for Regional Development (EFRO). INNLab’s engineering services turn products into producible products with innovative assembly processes, of which several innovative examples for high volume electronics and medical devices will be shown at HANNOVER MESSE. Elliptec Resonant Actuator AG presents new linear and rotatory positioning units at MicroNanoTec 2010. These new modules offer a very high resolution of only a few micrometers. Furthermore, new multifunctional drive kits for the Elliptec Motor X15G are introduced. The driver-kits feature an USBport for controlling the Elliptec Motor by PC software. The communication commands are available to the customer for integration in his own applications. Fraunhofer Institute for Silicon Technology ISIT will showcase innovative inertial sensors at the MicroNanoTec. The core competence of the institute is the development of miniaturized, highprecision acceleration and angular rate sensors (gyroscopes) with a very high device density and functionality. By chip-level integration of multiple sensors types and sensor axes, compact combined MEMS sensor systems can be manufactured very cost-efficiently. The combination of three accelerometers and gyroscopes into an inertial measurement unit (IMU) enables the real-time orientation and position tracking of a moving body. In a car these signals can be utilized for vehicle dynamic control systems like ESP. Autonomous position tracking can be used also for robotic navigation. Other applications are, e. g., position sensing in buildings or interactive interfaces for PCs for virtual reality animations. At the MicroNanoTec in Hanover KUGLER GmbH presents industrial solutions that combine surface technology and high-precision coordinate measuring technology. For instance, the company will showcase mirror optics on metal substrates, transmissive optics made of transparent plastics, spherical and aspherical functional surfaces, 3D components that combine tolerances of macroscopic geometry elements with tolerances of micro structures as well as coordinate measuring machines with multi-sensor technology. One of the company’s most accurate measuring machines is the LEGEX 776 by MITUTOYO. It is characterized by a linear measurement tolerance of MPEE = 0.35 + (L/1000) μm and a scan tolerance of MPEP = 0.45 μm for tactile measurements. Further special options for micro components are optical measuring heads with different magnifications, focused laser sensors and an ultrasonic micro switch. microdrop Technologies GmbH presents its newest pipette for dispensing fluids in the range of picoliters and nanoliters as its latest innovation at HANNOVER MESSE. The glass capillary has a longer design and can be dipped at a length of up to 9.5 mm. The fluid level inside is easily readable at any time due to the transparent body. Further advantages are good cleaning behaviors and the possibility to change fluids quickly. microdrop Technologies is the leading provider of dispensing systems for minimum quantities in the picoliter to nanoliter range. Next to dispensing and positioning systems microdrop provides software packages, dispensing tests and customized solutions. The Fraunhofer Institute for Laser Technology ILT will demonstrate remote laser fine cutting and high-speed cutting for prototyping and small lot sizes within seconds. The manufacturing of precise metallic parts is currently performed by milling, stamping and etching. These processes require long processing times or large efforts in tooling technology. For small lot sizes and prototypes, laser remote fine cutting is a versatile tool, which allows very short processing times and which does not require complex manufacturing machines. With high-power fiber lasers, highly dynamic scanning mirror systems and precision focusing optics, short cycle times can be achieved with processing times less than 100 ms for mm-sized parts. The processing accuracy can be set to < 10 μm so that this technology can also be used for precision components. developments for environmental and condition monitoring at HANNOVER MESSE 2010. Using a mobile infrared spectrometer, the analysis of fluidics will be demonstrated based on their spectral components. This spectrometer can support environmental or food monitoring. As a second analysis tool, Fraunhofer ENAS presents the award-winning Fabry Perot interferometer. It can be used for monitoring gases and gas mixtures in the infrared range. For engines condition monitoring, the Fraunhofer researchers developed an autarkic sensor system which can be integrated in mechanical parts. Fraunhofer ENAS will also present a printed battery as one possible solution for clean and versatile power source. The Fraunhofer Institute for Photonic Microsystems IPMS provides services for applying Micro-Electro-Mechanical Systems: The Fraunhofer IPMS features everything needed for the development, fabrication and integration of technologies for micro-electro-mechanical systems (MEMS) and microopto-electro-mechanical systems (MOEMS): outstanding technology know-how, expertise in industrial manufacturing projects and the necessary infrastructure, including state-of-the-art equipment and 1,500 m2 class 10 clean room facilities. With this potential, which makes the institute stand out from both commercial MEMS foundries and competing research institutes, IPMS wants to support especially small and medium-sized companies in applying innovative MEMS technologies. The CAN GmbH is an incorporated Center for Applied Nanotechnology, which is located in Hamburg, Germany. CAN offers contract research and development services in the field of nanotechnology to companies and institutions and participates in national and international research programs. These activities are focused on the utilization of new concepts in chemical nanotechnology and nanoanalysis in the areas of consumables, individual polymers and health care products. The main areas of expertise are the production of nanoparticulate and nanocomposite materials like magnetic, conducting, fluorescent, X-ray opaque, metallic and ceramic nanoparticles, the encapsulation of active ingredients and the development and characterization of nanoparticle conjugated biological markers. The PANADUR GmbH will showcase innovative, intelligent, solvent-free coating materials based on polyurea at the IVAM Product Market 2010. The use of nanoparticles in the PANADUR-system allows a targeted functionalization of the surface. Currently properties such as flammability, scratch resistance and conductivity can be generated by the use of nanoparticles. Through the use of nanoscaled silver, the company offers a permanent anti-microbial coating which is one way to combat the hospital germ. This system offers a variety of applications in the fields of automotive, leisure or fire protection. In-house laboratory prototypes can be manufactured in order to develop application specific formulations. Micromachine Center (MMC) is a Japanese non-profit organization who supports micro- and nanorelated industry development. Following companies are associated as examples: Panasonic, Sony, Omron, Canon, Denso, Fuji and many more. For this purpose, the initiative named MEMS Industry Forum (MIF) has been launched. The Exhibition Micromachine/MEMS presents current Japaneseresearch projects in the field of micro- and nanotechnology. KIT is a merger of Forschungszentrum Karlsruhe and university of Karlsruhe. KIT stands for top research and excellent scientific education, unrestricted exchange of know-how, and sustainable innovation culture. Within KIT, NANOMICRO is a Helmholtz Research Programme and dedicated to research and development of advanced multi-material micro and nano technologies. NANOMICRO activities span the entire range from fundamental science to high-performance technologies and integrated systems. NANOMICRO is facilitating innovation through the Karlsruhe Nano Micro Facility (KNMF), which offers free access to a unique set of technologies for structuring and characterization technologies on a peer-reviewed proposal base. Empa - a research institution in the ETH Domain has developed some interesting products including blimps that can swim and golf balls that cows can digest. The street sweeper is a world premiere. It is the first street cleaning vehicle that runs only on hydrogen. For four years, Empa staff were working "at this" clean street cleaner. It is now being put through18 months of testing in everyday use. A mobile phone with muscles? This is the redevelopment of the ETH spin-off "Optotune" in the Technology of Empa. Novel optical lenses that can change with the aid of electro-active polymers - "artificial muscles" - continuously change its focal length. It could replace the standard digital zoom, in two to three years on the market. The nanosciences are considered a key technology for our industrial future. Only a detailed understanding of the behavior of atoms and molecules makes that future possible. In order to observe molecules and the nanocosmos Empa researchers are developing a variety of high-tech metrology devices. Organic excitonic photovoltaics that rely on nanostructured elements to convert light into electricity are among the many discoveries being made in nanotechnology in Switzerland. A newly issued report by Swiss research laboratories and partners lead by Empa tracks nanotechnology developments in the Alpine country. The "Swiss Nanotech Report 2010” provides for the first time a comprehensive overview of current developments in the nanotechnology sector in economic and research in Switzerland. Switzerland's is among the most innovative countries in this area. The report, prepared by the numerous contributors from Empa, gives an insight into local conditions for research and development, technology transfer activities, cost-effective implementation and funding opportunities. Whether sun-protection creams, computer chips and coatings for cars, or glasses - Innovations from the "nano-labs affect" our daily lives more and more. For the Swiss economy, this new and growing technology plays an increasingly important role, but is nanotechnology as a sunrise industry with enormous commercial potential. This requires an efficient and smooth as possible knowledge and technology transfer (KTT) from the laboratories in the industrial enterprises, a process that is just for the Empa is of central importance. The aim of the "Swiss Nanotech Report" is to convey the first time a comprehensive picture of the Swiss nanotech landscape. In international comparison, Switzerland is among the most innovative countries in the field of nanotechnology: In 2006 alone there were in Switizer ten, "nano" inventions for patenting per million population. "This demonstrates once again the high level of innovation within the research site Switzerland, which has greatly increased in recent years," said Heinz Muller from the Swiss Federal Institute of Intellectual Property in Bern, one of the initiators of the report. A striking feature of nanotechnology is that it is a very interdisciplinary field of research. Innovative applications in the nanotechnology sector is far from confined to one sector, the opposite: How can nano-structures, for example, used to provide a more efficient use of solar energy to bring about a better water, or even to a more accurate diagnosis in health care - contribute, therefore applications that affect many different markets and sectors. More and more commercially successful products have been nano-components. The economic benefits of this technology is already out of question now, and is likely to become even more important in the future. To ensure the release of the latest knowledge and technologies from research laboratories into new products continue to be the closest possible cooperation between research institutions such as the Empa and industrial partners is necessary. Empa's contribution to the "Swiss Nanotech Report" highlights then just the knowledge and technology transfer. "Three things are essential in our view: attractive platforms to the contact between researchers and industry partners to facilitate a holistic view that says the varied forms of technology on projects, licensing, training and much more, and includes" clear cooperation models, Gabriele Dobeneck , Head of Marketing, Knowledge and Technology at Empa and a co-author of the report. In addition, Switzerland has also started early to deal with the potential impact of nanotechnology on health and the environment. Empa researchers are investigating how the possible effects of free nanoparticles on human cells and tissues, but also to different ecosystems and engage in public debate about the "pros and cons" of nanotechnology. One thing is clear: For the development of nanotech applications are a conscientious approach to the still-young technology and a broad social and political acceptance is essential. The Swiss Nanotech Report is a report on the latest developments of the Swiss nanotech industry. It reflects the growing importance of this new technology for the Swiss economy. As one of the pioneers in this field, Switzerland is an important location for research and development of nanotechnology applications. 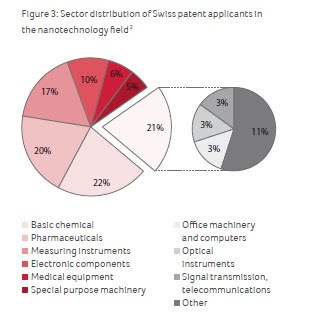 The report shows that nearly 21% of Swiss patents are related to nanotechnology. Swiss Nanotech Report 2010 is published by the project partners, which together with Empa, include the Adolphe Merkle Institute, the Ministry of Economy and Labor Basle-City, CSEM, the Swiss Federal Institute of Intellectual Property, IBM Zurich Research, i-net BASEL NanoLab / EPFL, the OSEC, the Swiss National Science Foundation, SIX Swiss Exchange, the State Secretariat for Education and Research and the Suva belong. 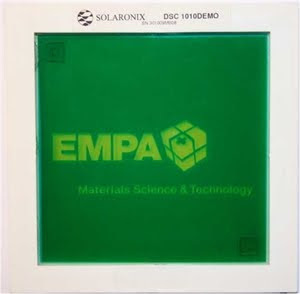 Swiss Federal Laboratories for Materials Testing and Research Empa is a materials science and technology research institution. It belongs to the ETH domain and as such is an important element in education, science and innovation in Switzerland. It specializes in applications, focused research and development, and provides high-level services in the field of sustainable materialsscience and technology. Its core tasks are innovative collaboration with industry and public institutions, ensuring the safety of people and the environment, knowledge propagation and university-level teaching. Empa engages in interdisciplinary work in a large number of specialized disciplines. Its key areas of research are grouped in five programs entitled Nanotechnology, Adaptive Materials Systems, Materials for Health and Performance, Materials for Energy Technologies and Technosphere – Atmosphere. Outerlimits Powerboats will make stronger hulls using Zyvex Performance Materials carbon nanotube enhanced resins. Zyvex Performance Materials (ZPM), a recognized worldwide leader in advanced nanomaterials applications, announced on February 15th an agreement with Outerlimits Offshore Powerboats to supply advanced resin systems for the Outerlimits 2010 line of high performance powerboats. The next generation nano-enhanced line of epoxy resins, from the Engineered Solutions team at ZPM, delivers greater strength and toughness to Outerlimits' high performance boats without requiring adjustments to their manufacturing process. Outerlimits Powerboats are renowned for their astonishing speeds and intense rough water ability, due to cutting edge design and the use of the most advanced composite technology available. The entire product line is built using an exclusive vacuum bagged carbon fiber reinforced lamination schedule, now cured with ZPM epoxy resin solutions. "Outerlimits Powerboats are built utilizing the finest materials known to man," says Outerlimits President Mike Fiore. "From the exotic leathers used in the interiors to the one of a kind paint schemes, everything is carefully chosen with the owner's unique taste in mind. Beyond the smooth flowing lines and exotic interiors is a race bred hull that has to be capable of withstanding harsh conditions." "Only Zyvex Performance Materials has the technology to enhance the materials used on the world's greatest powerboats," says ZPM President Lance Criscuolo. "We're extraordinarily proud to be working with Outerlimits and I look forward to seeing our products help Outerlimits reach new speeds and commercial success." Outerlimits Offshore Powerboats fills a unique niche in the offshore high performance industry by delivering custom, made to order powerboats for select clientele. Outerlimits has been a cutting edge company, staying ahead of its competitors since its inception in 1993. Through their innovations and a team of professionals who combine their individual talents to produce a level of craftsmanship that cannot be equaled, Outerlimits has been building boats that surpassed the others in design, luxury, and performance. DCG Systems acquired Zyvex Instruments LLC, the leading provider of nanoprobing characterization solutions for the semiconductor industry and advanced research markets on February 11th. Based in Richardson, Texas, the Instruments unit will now operate as the Zyvex Instruments Division of DCG Systems, Inc.
Zyvex Instruments’ flagship product, the nProber, is a state-of–the-art nanoprobing characterization solution for the semiconductor industry and is already proven on 22nm devices. The Zyvex NanoWorks® product line includes nanomanipulators and sample stages designed for operation in Scanning Electron Microscopes (SEM) and Focused Ion Beam (FIB) systems. These systems provide the ability to electrically characterize devices with feature sizes of well under 100nm while simultaneously imaging or milling. “Becoming part of the DCG Systems team increases our ability to solve semiconductor customers’ problems. The increased size of the combined support and sales organizations allows us to serve our customers better, and the broader product offering of the combined companies will enable new categories of solutions.” said Randy Schussler, General Manager of Zyvex Instruments. Schussler will continue in his role as General Manager of the Zyvex Instruments Division. Mr. Schussler has over 20 years of experience leading the growth of high technology companies. DCG Systems, Inc., a privately held company headquartered in Fremont, California, is the leading provider of semiconductor debug and characterization solutions for the global semiconductor industry. With a commitment to applying innovative technology to improve time to yield and time to market, DCG Systems delivers competitive cost and performance advantages to integrated device manufacturers (IDMs), wafer foundries and fabless chip companies worldwide. DCG Systems is comprised of the former Schlumberger/NPTest Probe Systems division, Optonics Inc., Hypervision Inc. and Zyvex Instruments LLC, with an installed base of over 850 systems worldwide. For more information please visit http://www.dcgsystems.com. Escalating use of nitrogen fertilizer is increasing algal blooms and global warming, but a discovery by Stanford researchers could begin to reverse that. They have revealed a key step in how symbiotic bacteria living in legumes turn nitrogen into plant food, which could be used to improve the process in some plants, reducing the need for chemical fertilizers. 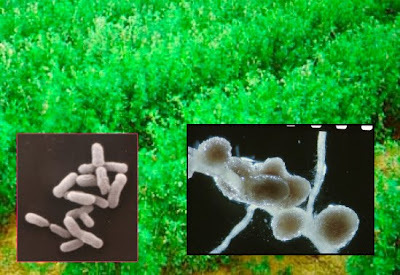 Bacteria (left) and the root nodules (right) in which they reside as they fix nitrogen inside barrel matic, a leguminous forage crop similar to fellow legume alfalfa, shown in the field in the background. Nitrogen is vital for all plant life, but increasingly the planet is paying a heavy price for the escalating use of nitrogen fertilizer. Excess nitrogen from fertilizer runoff into rivers and lakes causes algal blooms that create oxygen-depleted dead zones, such as the 6,000 to 7,000 square mile zone in the Gulf of Mexico, and nitrogen in the form of nitrous oxide is a potent greenhouse gas. But new findings by Stanford researchers that reveal the inner workings of nitrogen-producing bacteria living inside legumes such as soybeans could enable researchers to blunt those negative effects and aid efforts to make agriculture more sustainable. "We have discovered a new biological process, by which leguminous plants control behavior of symbiotic bacteria," said molecular biologist Sharon Long. "These plants have a specialized protein processing system that generates specific protein signals. These were hitherto unknown, but it turns out they are critical to cause nitrogen fixation." The ability of legumes to capture nitrogen from the air and turn it into plant food, or "fix" it, also leaves the soil enriched through the plant matter left after harvesting, creating a natural fertilizer for other crops, which is the basis for crop rotation. Alternating legumes with other crops has been a major component of agriculture around the world for thousands of years. Yet until recently, little was known about how nitrogen fixation worked, or why some legumes are efficient at fixing nitrogen and others poor. The key part of the process that Long's research group uncovered is a plant gene that triggers a critical chemical signal. Without the signal, no nitrogen gets fixed by the bacteria. Dong Wang, a postdoctoral scholar in Long's lab who pinned down the gene, is first author of a paper describing the work, published Feb. 26 in Science. Long, a professor of biology, is senior author. The beneficial bacteria in question reside inside the nodules of legumes such as peas, beans, alfalfa and clover, where they pluck molecules of nitrogen from air in the soil and turn it into ammonia, which feeds the plant. It sounds simple, but it is a complicated and poorly understood process. Only bacteria that contain a special enzyme are capable of this sort of "nitrogen fixing" using airborne nitrogen – no other type of living organism can do it. All other plants have to get their nutrients from using already fixed nitrogen in the soil. This special ability allows legumes to flourish in nitrogen-poor soils, whereas other plants require applications of manufactured nitrogen fertilizer to grow well. But even legumes can't flourish without the right symbiotic bacteria. "When you deal with a natural soil, you are dealing with a lot of complexity. Everything we learn about what makes symbiosis work gives us a tool to understand why, sometimes, symbiosis fails," Long said. "Plant breeders who are trying to help develop better-adapted plants can now analyze traits such as this. We've given them a new tool." The more efficient that legumes can be made and the wider the range of environments they can thrive in, the more they can help reduce the need for chemical nitrogen that runs off into water or sinks into the groundwater or decomposes into a gaseous form, Long said. The legume that Long's team worked with is called barrel medic, a forage plant similar to alfalfa. They tracked down the newly discovered gene by studying mutant plants that were failing to produce healthy nodules on their roots. While bacteria inside normal nodules will thrive, in the defective nodules of this plant those bacteria can't provide the benefit they are wired to deliver. Long said that the mutant "contained perfectly good bacteria, but was making these lousy nodules." Wang found that the mutant plants generated the proper precursor to the protein needed to nudge the bacteria into fixing nitrogen. But the critical enzyme for processing that precursor into the final signal was missing. So the bacteria simply sat, the nodules didn't develop and no nitrogen got fixed. By comparing the genome of the mutant plants with normal plants, the group found a gene that was missing from the mutants. Suspecting that gene might be the culprit, the researchers took a functional version of the gene from normal plants and put it into the mutants. The mutant legumes then began fixing nitrogen the same as normal ones, "proving that we found the right gene," said Wang. Since 1960, the use of nitrogen fertilizer in the United States has roughly quadrupled, as has the price per ton, according to the U.S. Department of Agriculture. Prices have been driven up by the rising cost of natural gas used to manufacture the fertilizer. "That might make things more expensive for American farmers and increase food prices for consumers, but this is going to wipe out people in developing countries, whose soils are perhaps most in need of fertilizers," Long said. "This is a crucial issue. And nitrogen fixation is a key to sustainability." Costs aside, the production of chemical fertilizer also adds to the problem of global warming, both by way of the fossil fuels used in production of chemical fertilizer and through the impact of leftover fertilizer that degrades into nitrous oxide, a highly potent greenhouse gas. With the planet's ever-growing population, Long said there is going to be increased need to keep productivity going on lands that are starting to become marginal because of drought, temperature or salinity problems, among others. 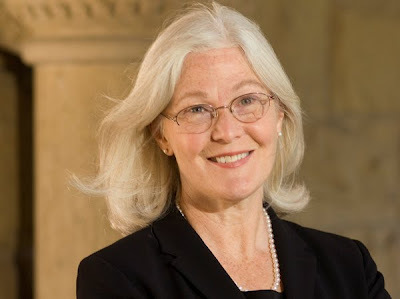 "The rhizobium bacteria are a critical partner in whether that kind of extension of serviceable land can occur," she said. "In order for us to take existing symbioses and help make them better, optimize them for being productive even when conditions start to deteriorate, tools such as understanding how to improve nitrogen fixing in legumes are crucial." Joel Griffitts and Colby Starker, also authors on the paper, contributed to the research when they were graduate students or postdoctoral scholars in Long's lab. Griffitts is now an assistant professor at Brigham Young University. Starker is a research associate at the University of Minnesota. The research was supported by the Howard Hughes Medical Institute, the Helen Hay Whitney Foundation and the National Science Foundation. Stanford molecular biologist Sharon Long's discovery could reduce the need for harmful chemical fertilizers.